If you’re an introvert, do you enjoy talking about yourself? Many of us don’t. We don’t want to share personal details. We’re also hesitant to ask other people personal questions. If they want to share that’s okay, but asking them feels like prying. We don’t particularly want to be pried into so we assume other people don’t either. But whether we like to admit it or not, sharing personal details and stories is key to building connections with people. Whether we want to have a good business relationship, keep in touch with acquaintances, develop a friendship, or enter a relationship with someone we have to be able to talk about ourselves and ask questions about the other person. 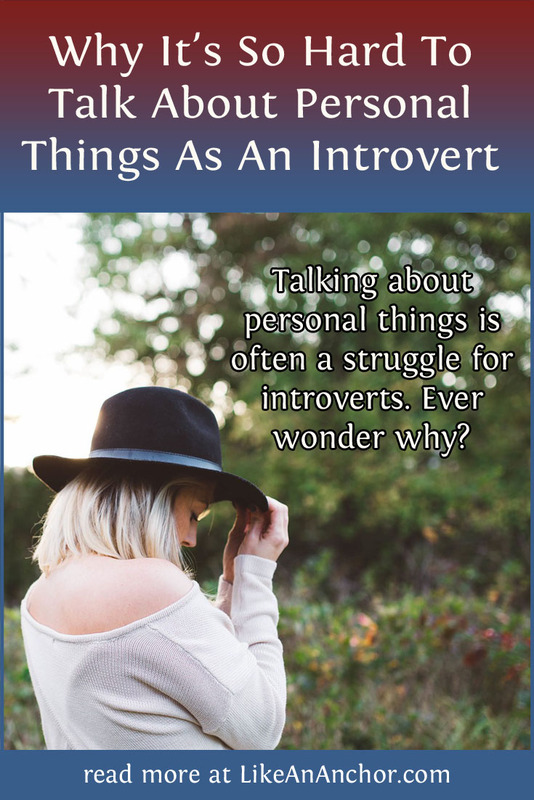 Learning to talk about ourselves and engaging with others on a personal level can be a challenge for introverts. This also means it’s a wonderful opportunity for personal growth. I don’t know about you, but I would love to be a better conversationalist. I don’t want to become “more extroverted” per se, but I do want to learn to communicate well as an introvert. 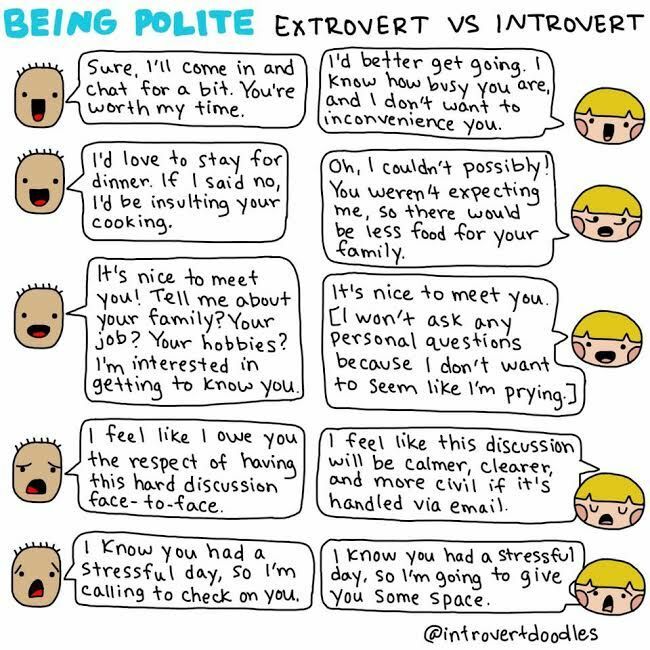 Introverts and extroverts have different ideas of what it means to be polite. This is perfectly captured by Marzi of Introvert Doodles. Click here to check out her website, and here to purchase her book (please note that this is an affiliate link which means, at no extra cost to you, I’ll receive a small commission if you make a purchase). There isn’t anything inherently wrong with either approach. However, misunderstandings can easily happen. An extrovert might feel ignored or snubbed by an introvert who’s just trying to be polite. An introvert can feel overwhelmed by the politeness of extroverts. 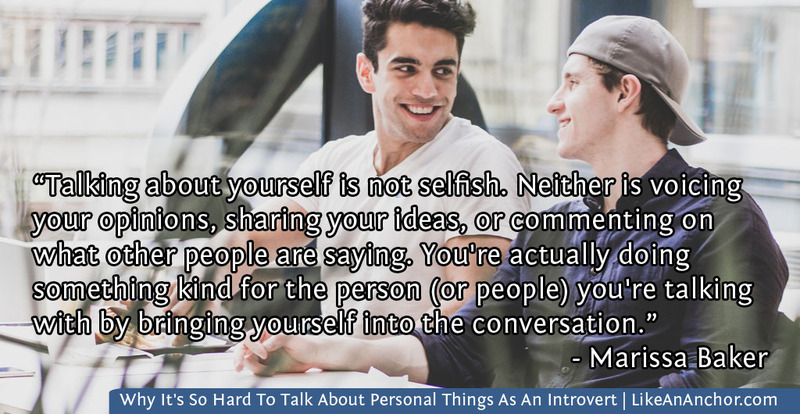 It’s important for introverts to keep in mind that asking about people and appropriately sharing about yourself is not rude. In fact, it’s expected for human interactions. You don’t have to try to turn yourself into an extrovert in order to do this, but you can learn to express yourself more while honoring your own personality. These are the sorts of things I’ve told myself for years. I convinced myself they were true and they fed-into my anxiety in a vicious cycle. As an INFJ, I’m one of the introverts that longs for harmonious connections with people, but I was terrified to open up enough to build those connections. It wasn’t a nice place to be. If you’re facing something like this, I encourage you to seek out a counselor. I’d done quiet a bit of work combating these fears on my own, but when I started seeing a counselor at the beginning of this year I realized just how much someone like that can help. It’s so nice to have someone who you can talk to without judgement, who can hold you accountable about not letting these fearful thoughts win, and who can give truly helpful advice. It’s nearly impossible to keep a good conversation going when one of the people in the conversation won’t talk. Unless you desperately want to get out of the conversation, it’s important to engage with the person you’re speaking with. You’re probably already a good listener, and that will help draw the other person out. Talking about yourself is not selfish. Neither is voicing your opinions, sharing your ideas, or commenting on what other people are saying. You’re actually doing something kind for the person (or people) you’re talking with by bringing yourself into the conversation. Your turn … what challenges do you face when trying to communicate personal things in a conversation? Thanks for writing this article! It is definitely hard for me, especially finding people who are actually interested in talking about personal things.